Watch me on Fox 5! Home » Watch me on Fox 5! 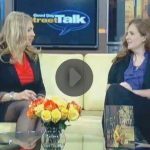 I will be on Fox 5’s Good Day Street Talk this coming Saturday, March 29th at 6:00 a.m. The very cool Lisa Evers (of, among other things, Hot97 fame) is the interviewer. Watch me talk about THE SECRET SIDE OF EMPTY and the reasons why I wanted it to be out in the world. There were some other pretty awesome guests on (including a group that performs one-minute plays) so it should be a fun show to watch. New York City area folks, be sure to tune in. For those of you outside the NYC tri-state area, watch this space because I’ll be posting a link to it as soon as it’s available.